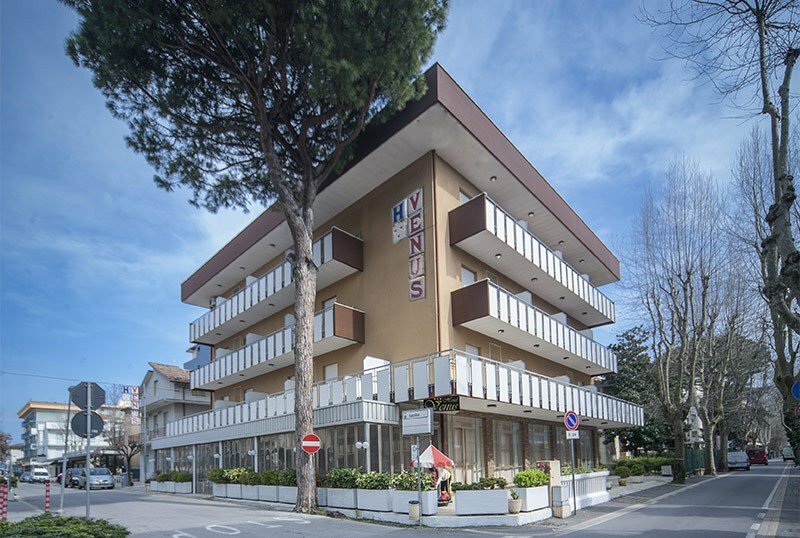 The Hotel Venus , 3 stars of Bellaria Igea Marina family run, is a structure with parking, open-air porch, garden, WI-FI internet and family rooms. Accepts small pets. The property is located in Igea Marina, in the city center, a few minutes walk from the beach and the Parco del Gelso. All rooms have satellite TV, bathroom with shower, hairdryer, air conditioning (extra charge), balcony, safe. On request: minibar. Single, double and triple rooms are available. Garden and equipped open-air porch, terrace, free use of bicycles, TV room, elevator, theme nights. AIR CONDITIONING: present in the common areas and in some paid rooms. LUNCH AND DINNER: typical Romagna and Mediterranean cuisine in 2 choice menus available at the buffet and accompanied by seasonal vegetables. On the beach: playground, baby club, live entertainment. The hotel has an agreement with the Bagno Solaria of Igea Marina. Stay in our Hotel from 16 June to 4 August and from 25 August to 15 September, in full board, our offers dedicated to children is amazing. Children up to 3 years are FREE, in room with 2 adults! Children up to 6 years are FREE, in room with 2 adults. Easter Offer and Spring Bridges: discounts for Mirabilandia! On the occasion of Easter and Spring Bridges, you can treat yourself to a holiday of relaxation and fun in Igea Marina! To all our guests we reserve small discounts with vouchers on each ticket purchased for the Mirabilandia Park. The marvelous park is only 25 minutes by car from our hotel, and the shuttle service is guaranteed. Call for more information and a personalized quote.